Wait, How Does The Flash Even Still Exist? Spoilers for Season 1 finale of The Flash are below. I’m not going to sit here and pretend to understand everything there is to know about time travel, even when it comes to a fictional property like The Flash. I can only use my limited intellect and the clues and rules that the show has laid out. And from what the finale showed us, I don’t understand how The Flash is still around to take care of the massive wormhole in the sky at the end of the episode. Shouldn’t that version of him have blinked out of existence along with Eobard Thawne? For a bit of background, Barry spent part of the episode weighing his options of going back to the past to save his mom Nora from Reverse-Flash, which would have allowed him to live a normal life (in that timeline). It’s made extremely clear that if he succeeded in doing this, The Flash would (probably) have never existed, which means Thawne would have never had to go back in time to get revenge on Barry for whatever reason. That’s all pretty wrapped up. When Eddie unexpectedly shot himself to put a premature end to that section of the Thawne family tree, though, it made Thawne disappear from existence, since he wouldn’t ever have the chance to be born in the future. Which means he’d never have gotten stuck in the past after trying to kill Barry’s mom, he wouldn’t have taken over the body of Harrison Wells, and he wouldn’t have quickly progressed the creation of the particle accelerator, which turned Barry into The Flash (among other things). So how would Barry still have superpowers if Thawne wasn’t around to develop them? What’s more, if Thawne never killed Barry’s mom, then Barry would have had a normal childhood and probably wouldn’t have had the same life. There are some possible solutions as to how this could still work out. (Duh.) We know that Tom Cavanagh is coming back to the show as a regular for Season 2, though the creative team isn’t saying in what capacity. 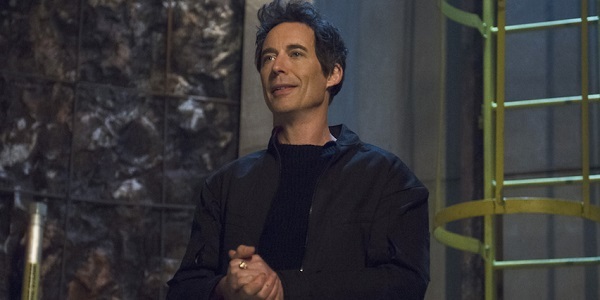 The real Harrison Wells was working on the particle accelerator with his wife, and Thawne revealed at one point that they would have it up and running by 2020. Theoretically, the same event could have happened in the future, turning an older Barry into The Flash somehow, and maybe there’s some other Substitute Thawne madman in the future who gets pissed at Barry for the same reasons, and then that guy goes back into the past and sets the original timeline back in motion. What that half-theory comes down to is Barry somehow being destined to become The Flash, with the universe course-correcting whatever it needs to in order to make that happen. It seems like there would be a way for Barry to get superpowers without having to go through life without his parents by his side, but maybe the universe just really hates the elder Allens for some reason. If destiny is a part of this, it could also be that some other section of the Thawne bloodline is affected, making it so that Eobard could indeed exist in the future without Eddie having to survive. So maybe Eobard is actually still around in this version of the timeline, watching the S.T.A.R. Labs group fretting over the wormhole from down the road or something. Speaking of, since we have no idea what will happen with the wormhole that opened up above Central City, it’s entirely possible that this disastrous scenario will play into things. I’d say “maybe Barry runs so fast that he goes back to before Eddie killed himself,” but that still wouldn’t explain how he’s there and able to do such a thing. We know that there will be multiple timelines and parallel universes coming to Season 2, so it could be that the wormhole is allowing a different iteration of Barry to exist in the present, having traveled from elsewhere in order to save the day and himself in the process. If he was indeed a Future Barry or a Parallel Barry, we would be oblivious without him explicitly stating it. I’ve probably talked in circles for too long already, as Future Me is tapping his watch (which also doubles as a hovercraft, because the future). Given the inherent complications with time travel, conversations about it could feasibly last all the way until The Flash returns for Season 2 in the fall. Let us know your thoughts on the situation in the comments.